Part of Point Douglas Road just north of the Bailey Road exit on U.S. 61/U.S. 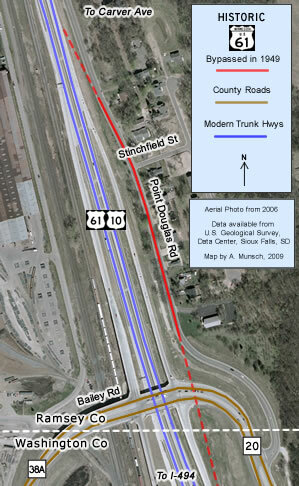 10 was once on the alignment of the original paved highway between St. Paul and Hastings, first marked as U.S. 61 in 1926. The original road was replaced in 1949 when U.S. 61 from just south of Highwood Avenue in St. Paul to Newport was upgraded into a divided highway. A short section of the old road north from just south of the Ramsey/Washington County line was left behind along the east (northbound side) of the highway as a service drive. The service drive connected to U.S. 61/U.S. 10 at both ends. In 1959, the construction of I-494 resulted in the destruction of the old road south of the county line. The service drive was connected with a new road that bypassed the U.S. 61/I-494 interchange and fed onto Bailey Road. The service drive was eventually extended north to Carver Avenue as well. Today, the stretch of the service drive actually on the original alignment is marked by a grove of old-growth trees along each side, somehow untouched by the extensive modernization and expansion that has taken place nearby. Otherwise, it has been repaved and widened to blend in with the rest of the road. 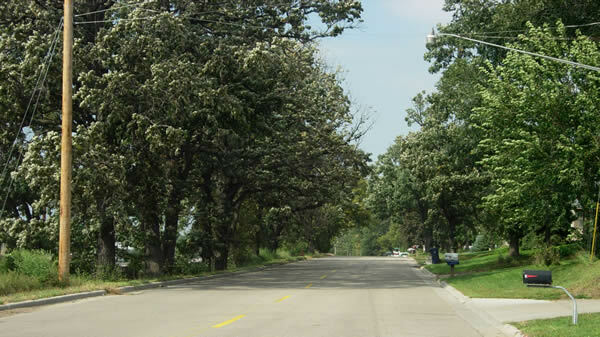 On Point Douglas Road, looking north through the hidden surviving segment of the original alignment of U.S. 61, shaded by growths of large trees.